The Bharatiya Janata Party (BJP) on Thursday demanded the resignation of Kerala Chief Minister Oommen Chandy for his alleged involvement in the solar scam. "The Congress Party should be speaking out rather than asking for a report, summoning the Chief Minister and everything else. We demand that the Congress High command speak on this matter. We demand that the Chief Minister should resign," Minister of State (Independent Charge) for Commerce and Industry, Nirmala Sitharaman, told ANI. "It is a grave charge of corruption, one after the other, now at the doorstep of the Chief Minister himself," she added. The Thrissur Court in Thiruvananthapuram has directed that an FIR should be filed against Chandy in connection with this scam. A petition has asked for a case against the Kerala Chief Minister after one of the two main accused in the case, Saritha Nair, told an inquiry commission that the CM's personal staff was bribed almost to the tune of Rs 2 crore. Saritha Nair and her live-in partner, Biju Radhakrishnan, are accused of collecting crores from industrialists after promising them solar panels at cheaper rates and using political connections to land big contracts. Chandy had earlier on Monday appeared before the probe panel in connection with the scam. The scam, which is being probed by a Commission headed by Justice G Sivaraman, was constituted by the Chief Minister in 2013 following massive protests by the Left-led opposition. Biju Radhakrishnan, the prime accused in the solar scam case, had alleged in December 2015 that he paid Chandy a bribe of Rs 5.5 crore, of which Rs 5.1 crore was collected personally by the Chief Minister while the rest was paid to his personal staff. The Chief Minister has so far maintained that he has done no wrong and is prepared to face any probe. The case took a political turn with the arrest of one of Chandy's close personal aides, who has alleged links with the accused. Two other employees in his personal staff are also under the scanner in connection with the scam. What is the Congress saying? The Congress is feeling the heat just three months before Kerala goes to polls. 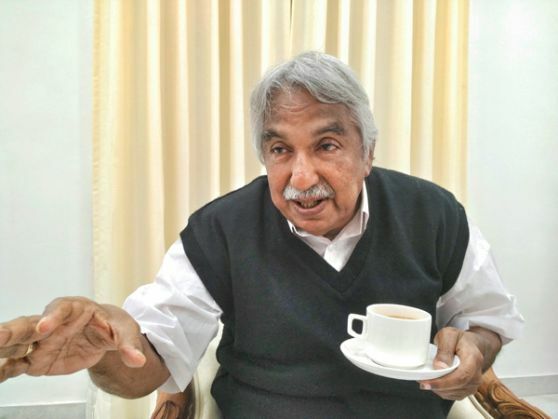 Chandy's cabinet colleagues had resigned last week after the Vigilance & Anti-Corruption Bureau (VACB) registered a case against him in another scam - the bar bribery scandal. However, the embattled party, as of now, is backing the CM firmly. Speaking at a press conference, party spokesperson Randeep Surjewala said: "Congress party is of the opinion that there is no need for Kerala CM Oommen Chandy to resign at this stage." Defending the scam-tainted Chief Minister, Surjewala said that the alleged scam didn't lead to a loss of one rupee to the state exchequer. Indicating that internally the Congress party had taken serious note of the alleged scam, Surjewala said that Chandy is expected to submit a detailed report to the central leadership after talking to his coalition partners and cabinet colleagues.